True Om - Wholesaler of headphone & other products in Delhi. 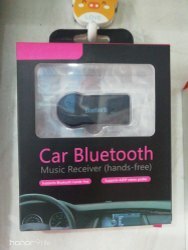 Top Quality Car Bluetooths Available @ Lowest Prices GUARANTEED. Best Design, Price and Top Service Guaranteed. All other accessories avaialable as well. Can connect to any stereo audio input device. Now you can listen to music from your phone, laptop or iPod without the hassle of cables. It can connect to home A/V systems, home stereos, headphone, automobile or motorcycle speakers, Boats, RVs and more. Suports Wireless Handsfree. Suports Wireless Stereo Music Play . Echo Cancellation Andnoise Supression (cvc) Technology. - Listen to Music From Your Smart Phone or MP3 Player On Your Existing Home or Car Audio System With Wireless Bluetooth Connectivity.